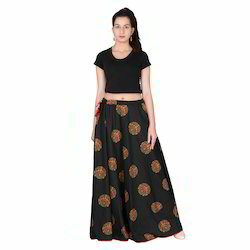 Leading Manufacturer of Womens Skirt, Long Skirts, Rajasthani Skirts, Cotton Skirt, Formal Skirts and Fashion Skirts from Jaipur. We can customized these skirts in any waist and length size in bulk quantity. A great looking Designer Skirt.This skirt gives you a elegant look. 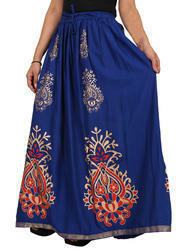 It is in pure Designer and in multi colors. Floor length & new style makes this different with others! and This skirt gives you the cool look . A designer piece.How about a most comfortable skirt that not only dresses you in the most soothing way but also allows you to make an artistic statement.The clothes we are wearing should double as an expression of our sense of aesthetic and these skirts will definitely do that! If you need any different size and design we also make.Please contact us for long term business.